To potty learn or not to potty learn – that is the question! My son Dylan turned two this past February and is currently in diapers. My husband Jake and I have been dabbling in potty learning, but we haven’t made any real progress. It started this summer, when Dylan was 18 months. We noticed him peeing a lot in his bath, and we discovered that he could pee on command. When he’d get in his bath, we’d say make a pee, and lo and behold, he would! So we bought him a potty and he consistently peed before his bath in the potty. During the summer, I also started cloth diapering. It was something I was interested in earlier, but only started this past July when a cousin of mine who cloth diapers her twins helped me with it and really got me into it. Between the pottying and the cloth diapering, I was feeling like a wonderful mama! Anyways…I digress. Somehow once summer was over and we got into our regular busy routine, the peeing in the potty before bath time stopped. And I am sad to say that the cloth diapering stopped too when I went back to work in November. This brings us back to the present. 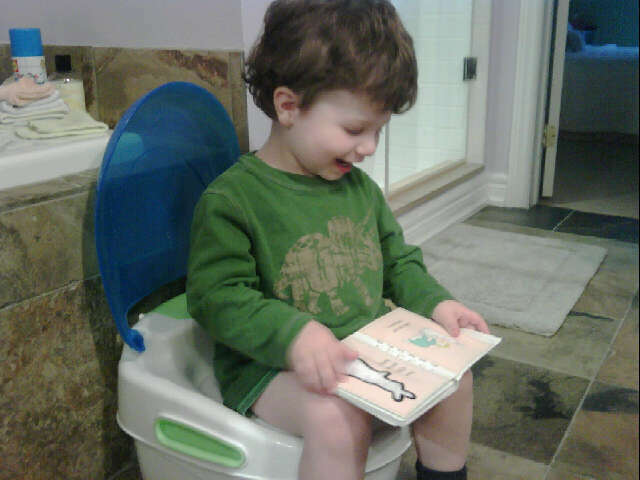 Dylan is showing many many signs of being ready for potty learning. He tells me when he pees in his diaper and it is very very obvious when he needs to poo. He runs around the room and usually comes up to me and tells me he wants me to hold him. Once he does poo he doesn’t like the feeling at all of having it in his diaper and wants me to change it right away. He understands everything we say to him, can follow instruction, and communicates very well in full sentences. Lately, when we try to get Dylan to go on the potty he flat out refuses. He completely understands what it is for and he watches me and Jake on the toilet all the time (no privacy in our family!). We tried a sticker chart – we told him when he pees on the potty he gets a sticker. This has worked twice in the last week. He sits on the potty for about ten seconds, makes the world’s smallest pee (like a few drops) and then we give him a sticker. He then gets in the bath and lets out a giant pee! I haven’t even tried with a poo because I am afraid he will start holding it in and get constipated. This past weekend I tried putting him in cloth diapers again, hoping that would make him more aware of peeing. It didn’t At one point his cloth diaper was totally soaked from a giant pee and it leaked out and on to his pants and he didn’t even care. So fellow readers, what’s a mom to do? Forget about potty learning for the next little while? Be more consistent about it – put him on the potty more often and hope to catch a pee? Wait until the summer when he can run around naked at the cottage? As an AP mom I want to follow Dylan’s lead and let him do it when he is ready. Then I hear about moms who practiced elimination communication and I feel like we have no excuse at this point. I also hate the environmental impact of all the diapers we are using. Cloth doesn’t seem a viable option for the 3 days a wk he is at daycare, but perhaps I should start using them again on days he is at home. I’d love to hear about your potty learning adventures! Categories: Uncategorized | Tags: toddlers | Permalink. I can only give my experience with two little cloth bums. We have the potty in the bathroom next to the toilet, and whenever I went, so did they. When they were little it was a convenient place to put them, after that it was fun to copy Mummy. We never bothered taking the nappy off unless they asked, it was just about sitting. I consciously went to the toilet a LOT so they were doing it 10 times a day. It’s very hot here so we spend a lot of time naked, they both naturally started weeing with me. We still had lots of accidents, and they would be involved in cleaning them up, then they just naturally started going to the potty themselves. Since birth they’ve always been changed as soon as they were wet, it just sort of changed gradually from them telling me they were wet to letting me know they were about to wee to having enough warning to get them to the potty. Terry flats were great at this point – they’re so cheap it didn’t matter if we went through 10 a day! So I suppose at this point I’d be getting him to sit whenever you do but not worrying about actually producing anything, and making sure he’s aware whenever he’s gone and changing straight away. Just keep it low key and don’t stress, it’ll happen. Good luck! Hmm. I haven’t got to that stage yet. My son is 18 months, has been in cloth nappies from the beginning and seems to have no idea he is doing anything in them. I was wondering as the weather gets warmer whether you could allow your son to go without a nappy or whether you would be prepared to try undies? Often a child gets so wet in undies they are willing to use the potty. Or training pants? I work with children with special needs and I know that one strategy that is used is asking the parents to keep a diary for a few days of when they seem dirty, wet or dry and toileting them at those times. So perhaps you could get him onto the potty at the time he usually goes. Other ideas are putting him on the potty when you go. What does he do at Daycare? Can they start toileting him? Often at day care they get all the kids to go at certain times. It may be that he is scared of something. Could he be a bit constipated. Maybe stickers aren’t the kind of reward thats going to get him going? Sorry no specific answers, but I hope one of my ideas help. Or it could be that he just isn’t ready. I know as an AP you won’t push the issue with him, although he does sound like he is on the right track a little encouragement could get him over the line. I’d love to hear how you go. Then one morning I woke up and said ‘no more nappies ever’ and I meant it. (he was 27 months). I put little pants on him or let him run around in a big t-shirt with a bare bottom and every time he would start to go I would rush him to the potty and if he even got one drop in the potty I would praise, praise, praise. If he didn’t make it I would casually say ‘oh well, next time’. I tried to remind him every ten minutes or so to sit on the potty but if he seemed frustrated by this I let it go and just watched him carefully trying to catch him in time to get him to the potty before the wee (or poo) was all over the floor. The first three days were VERY messy. I was cleaning the floor constantly but I never fussed about it and maintained the attitude that this was just a new naturally part of our day and night. —night time was surprisingly easier than I thought it would be. I had a stack of sheets by his bed in case he wet before we got to him so I could change the bed quickly but usually he would start to cry, we would RUN to him to take him to the potty and I only had to change the bedding a few times before he began to understand the new routine. After the first three days he began to hold it until we reached the potty and by the end of the first week he totally had it down. We still had LOTS of accidents but with lots and lots of reminding we had less messes and even ventured out to the shop – nappy free. At the end of week 2, he would tell us when he had to go and he would go when we reminded him to and he has been a ‘no nappy’ child ever since. (we still remind him to go often and once in a very blue moon he has an accident but it’s never a big deal). I think the secret was our attitude. We took the whole thing in stride, casually saying ‘ok, this is what we do now’ and also made a total switch to never using nappies instead of using them sometimes and sometimes not. Sorry for the rambling comment;-) and best of luck!! I don’t have much to add except to totally agree with Earth Mama. I also used the “naked” method with all 4 of my boys. Worked like a charm. You also have to establish that there are “no more diapers”. When we were potty teaching, I also went to pull-ups at night, for those who needed them (many kids learn quickly during the day, but night-time dryness takes longer). Because pullups are pulled on like underwear, this seemed to make a difference – it was NOT a diaper to them. I always would get out the LAST package of diapers and tell them – “when these are gone, no more diapers! You’re a big boy, and can go in the potty”. Always be very matter-of-fact – not punitive for accidents. (Oops! You had an accident. Next time let’s go in the potty!) It’s also helpful right after they have an accident, to go ahead and sit them on the potty for a moment (Let’s see if there is any more. No? Okay, next time, just remember to sit on the potty!) Also be matter-of-fact when they do go – don’t go over the top with praise. You will clean A LOT for a couple of days, but if they are running around naked all day in the house and the yard, they get it quickly. Once they start going regularly, I would just remind them every few hours. We also definitely made it a “rule” that everyone goes when we leave the house. Since we have many children and we’re running around a lot, this ensures fewer accidents. When we are not at home, I also make sure to mention that there is a potty, and where it is. Hope that helps! I first thought our daughter was ready when she was about 18m old. she was intolerant of wet nappies, talked about what she had done, showed all the signs I thought that she was ready, but our efforts then failed dismally. After much pondering about it and quite a bit of worrying on my part that we had left it a lot later then most of our daughter’s peers, we were surprised one day when she got up and said ‘no nappy today mummy’. We took our cue from her and it worked a dream, a few accidents for a few days and then completely dry during the day from then on. She was nearly 2.5 yrs old. My only advice is don’t push it, which I’m sure you won’t and don’t worry anoput it too much either, it will happen naturally. I have twin boys, and I can tell you from experience, that kids are completely different when it comes to potty training! At 2 years old my boys were not even close to ready to be potty trained. They did begin to show an interest, and this should definitely be encouraged. By 2 1/2, one of my sons pretty much potty trained himself and by 3 he was completely dry both day and night. He was devastated when he had an accident. Then there’s my other son. By 3 he was about half potty trained, and had never, ever had a dry night. By 4 years old I was waking him up in the middle of the night to go to the bathroom, and that finally solved that problem. He just turned 5 and is still having accidents during the day! My daughter also had accidents continually until she started kindergarten. I know people have different opinions about this subject, but I really think they finish potty training when they are ready. If you fight with them about it, it becomes an area of control for them, and it’s very hard for you to win. I don’t have any real advice because my daughter is 14 mo. but my goal is to just act like potty learning is not on my radar at all (and try not to panic since it will totally be on my radar). I think for boys that 3.5-4 years is normal, right? I’m reading Alfie Kohn’s book right now and I think he would be against the star chart because it could have the reverse effect and make him not want to use the potty. Biggest advice, that several other mamas has said, is make sure you relay a positive/relaxed attitude. Anytime I started stressing about PT, Everett could tell and he would act accordingly. We had a fairly diff. experience with naked PT and cloth dipes. Everett has been in cloth since he was born and doesn’t give a hoot about being wet so they gave him no motivation to get out of them. We first PT’d naked and he picked it up quickly. We have mostly wood and tile floors, so it worked beautifully. Problems arose whenever he would put on anything- dipes, training pants, undies- he would pee. We had to drop the PT, give it a while, and start over with training pants and undies. His interest waxed and waned but once he hit about 33 mos. something snapped and he was suddenly dry almost all the time, day and night. Now 37 mos. and has few accidents. It was just a matter of time. There were a few particular tricks that worked for us. It was actually my DH’s idea to make a game “shooting” the water with his pee. Then it was toilet paper or cereal sometimes. He loved that. For a while we tried treats, too- like veggie straws or crackers, and he was excited about that. I just didn’t want to keep giving out that type of reward eventually. Lastly, once we were doing pretty well we just made sure we went on a routine basis… when we woke up, before we ate, before we left the house, when we came back to the house, before nap/quiet time, before bed, etc. Wow I’d like to thank EVERYONE for your very detailed comments. They are all extremely helpful. Looks like the naked approach has worked for a lot of people. Also not stressing about it seems to be the way to go. For now I’m going to let it be and try again in a few months when we are at the cottage and Dylan can run around naked in the grass. I don’t have any experience yet with potty training as my son is just 13 months old. I have, however, recently begun reading several books on elimination communication and the message generally seems to be not to stress over it in a way that communicates that the process is extraordinary rather than a normal daily activity. As well, you should not begin until you are ready to fully commit to it because inconsistency tends to create confusion and possibly resistence. Again I am only book schooled at this point so I can’t offer any first hand wisdom. I am also grateful to all the moms who commented so precisely as this will definitely benefit me down the road. To me, potty learning is a process. It is something that starts at birth and continues until they are completely independently using the toilet. So from that perspective, I wouldn’t see it as “to potty learn or not to potty learn”, but more “do we need to slow down?”. Look for cues from your child and go at his pace. My son went from diapers to being independent over a period of about four months (those being the 4 months leading up to his third birthday mostly). My daughter refused outright to use the potty, but the day she finally agreed to try it, she never looked back. That was about 1 month ago now and she hasn’t had a single accident since. We did part-time elimination communication with cloth diapers from birth or thereabouts. But then came the potty strike. I’d heard about potty strikes, which is where a baby/toddler absolutely refuses the potty for awhile, but I wasn’t prepared for how discouraging I’d find it. But you know — it passed, and right after Mikko agreed to use the potty again, he basically stopped going in his diapers. That was right before he turned 2. We still have occasional accidents, like tonight! When he didn’t want to poop in the public toilet, did some in his pants, and then did consent to do the rest in the toilet. (Phew!) So I agree full toilet independence is a continuum. I don’t mind continuing to help him for now. Things that worked for us: patience, nakey-bum time, set times to try pottying (before/after waking, before/after going out, for instance), cloth diapers and cloth training pants, and being matter-of-fact about misses. Things that didn’t work and made me feel like a heel: making a huge deal out of an accident or despairing that he would never potty train. Because he will, no matter how long it takes or what path you choose. Here’s a post I wrote about using EC techniques with a toddler: http://www.hobomama.com/2009/12/using-elimination-communication.html Just some ideas to be respectful and patient and use your connection with your son to your advantage, reading his cues and taking things at his pace. My daughter’s only just two – so I’m at the beginning stages of potty training. And although she’s quite happy to sit on it, she hasn’t done anything in it. And she’s really difficult to read, too. I recently blogged about this and the consensus seemed to be that if you waited until they were ready it would all be done within a week or so, but if you pushed them it could take ages. I would suggest forget the potty for now. If he wants to use it, GREAT, but I would just put it to the wayside for the time being. Don’t force it whatever you do! If he wants to run around naked then let him. Whenever he decides to use the potty,make a big deal about it. I had two kids in cloth diapers for about four months. I was going crazy!!!!! One day I woke up and just couldn’t do it anymore. I told my son he was wearing underwear and using the potty from then on because mommy was going crazy washing all the diapers. And he had accidents for one day. He was just over two years old. It was interesting because if I hadn’t had my second child I probably wouldn’t have forced it like I did. But forcing my son didn’t cause him any stress at all. So I have mixed feelings about it. Personally I wasn’t emotionally doing well at the time. I had a newborn and a toddler and I was still trying to figure it all out. Having him potty trained helped tremendously. So anyways…I don’t know if that helps at all but that was our experience. also I left you an award on my blog…. Thank you again everyone for all of your comments! They are all greatly appreciated and I have learned so much from them! Oh Honey! I had the same child!!!! I mean I could have typed the same question, with the entire story of what you have been through! Here is what I finally decided…no 1, everyone would agree that a baby not raised from a very young age with EC is not gonna pick it up, or have the same feelings about it at age 2. Once my son began the fight NOT to use the potty, I said FINE!! You know your child will not start kindergarten in a cloth diaper:) My point is….bring it up, if the response is negative, drop it. Its a control issue at this point. I am all for Child led training, but toddlers also like to push the limits. My son was finally potty trained at 4. He still wears a pull-up at night at 6. And by potty trained I mean, he would go at home but always wore something if we were gonna be gone for a while. Or if I thought the situation would be “so fun” he wouldn’t stop to tell me he had to go. Or he would hide in a corner to go poo….this may have been mean but this is what I did next…and still do. Whenever he went in his pants I would go on and on about how disgusting it was!!! “To poop on yourself!” And I would talk about his friends that didn’t do this and went in the potty!! I would make him help me clean up….and believe me there is not a three year old in the world that wants to wipe there own poo or watch you rinse it in a sink. Every child is motivated in a different way. And with my first, it was not with timing and he could care less if I thought it was a good idea. It was about him being ready, at 4. Before then, nothing about it bothered him bad enough. Hi, just want to throw in my two cents. Sorry if I am repeating people. I would use the cloth diapers whenever you can. They are just all around a healthier option. In EC language, refusing to use a potty is called a “potty strike” so your son is probably going through something similar. I think the best thing to do is let it be his idea. Back off on offering for a while. Then gently begin to offer again, not too often, and if he says no, respect that. I personally am against using rewards for going potty. They should use the potty because they want to, not because they are going to get an external reward. I also think it would make him focus on the sticker instead of listening to his body. Whenever you are feeling up to letting him go naked, by all means do it. Get some extra potties and put them in convenient places. It’s up to you how much you want to rely on modelling versus teaching, but for our son we tell him that pee goes in the potty. If he pees on the floor, we say (nicely) “Where does pee go?” and he points to the potty. We never do anything to embarrass him. (He’s 21 months and has been EC’ed from 2 weeks). Pingback: Mama, That’s Too, Too Boring!